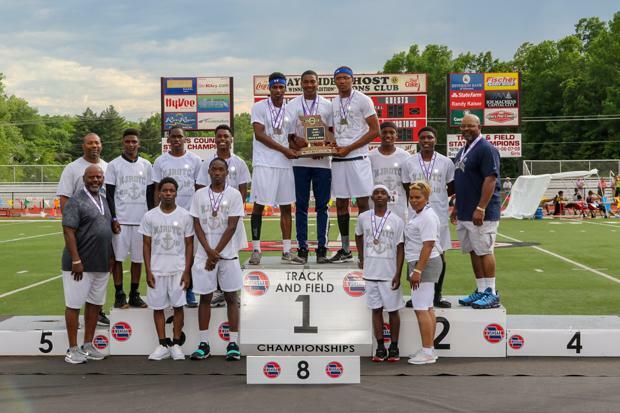 On Saturday night Cleveland was able to walk away with its 2nd straight Class 2 Boys State Championship, and their third straight State Trophy (2nd in 2016). This group of boys had been dominate all season long, and they were able to come through on the big stage. Kelsey Cole led the way for the Commanders with 30 team points as he won the 200, Long Jump, and Triple Jump State Championships. His Triple jump mark of 48-03.25 was just a little over an inch off of the Class 2 State Record of 48-05. Cole also anchored Cleveland's 4x100 with Hervin Cogio, Malik Harris, and Darrius Jackson which placed 4th. Antonio Norman was also huge for Cleveland scoring a total of 20 points after winning both the 100H and 300H State Titles. Unfortunately, the weather on Saturday didn't do him any favors as he was unable to challenge the State Meet record of 37.25, but a 37.77 in those conditions is still mighty impressive. James Allen brought home 14 points in the open events with a 2nd place finish in the 400 and a 3rd place finish in the 800. Allen also anchored NJROTC's 4x800 with Mark Hutchinson, Malik Harris, and Dante Burks which placed 3rd. 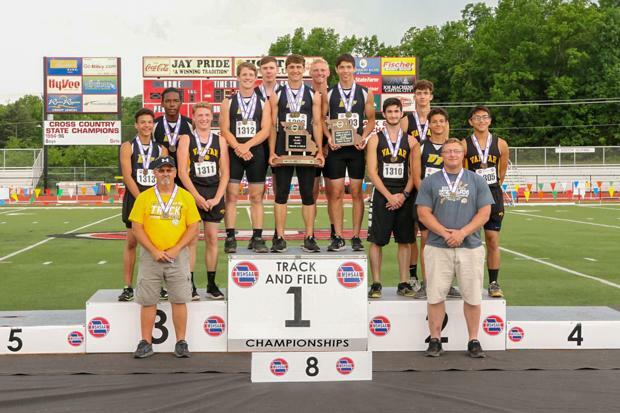 The Panthers showed up to perform this weekend, and went home with a State Championship.After only being ranked third coming into the weekend, they gave everyone a reminder that rankings don't matter once you step onto the track. Daeja Carter had a big weekend for the Panthers placing 2nd in the 100m, and 4th in the Long Jump. 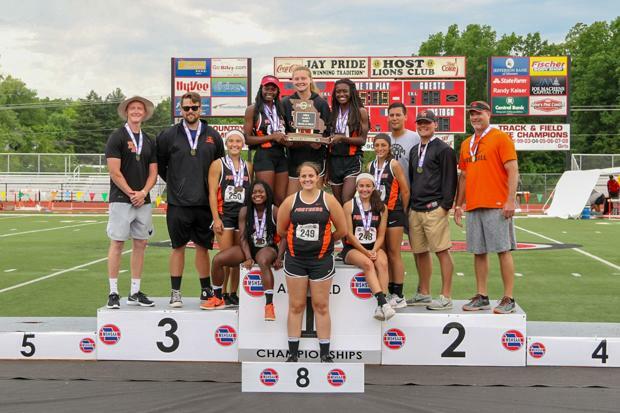 She was also a member on their 4th place 4x100 with Carolyne Corbett, Deaja Holloway, and Zoey Hodson, and 4x400 with Moriah Shaw, Kaitlyn Everts, and Hodson. Moriah Shaw also had a good meet placing 3rd in the 100H and 4th in the 300H. Jessica Sader also brought home big points in the throws after winning the Javelin and placing 4th in Discus. Van-Far ran away with the Class 1 Boys State Championship, making it their second consecutive title. They were lead by Josh Hodde who won both the 110H and 300H on Saturday, and also placed 3rd in Long Jump collecting 26 team points. Verlyn Johnson added to the total with a 4th place finish in the 200, and Parker Wallace also picked up a 3rd place finish in the 400. Van-Far also dominated the Relays as they scored were top 4 in all of them. The 4x100 team of Jacob Garner, Johnson, Wallace, and Trevor Crider placed 2nd, while the 4x200 team of Garner, Johnson, Wallace, and Crider took 1st. The 4x400 team of Wallace, Brennan Wheeler, Crider, and Dillion Minor took 3rd, and the 4x800 team of Morgan Slatten, Tyler Robinson, Samuel Hazel, and Lathyn McMorris took 4th. This was a nail biting finish, as West Platte had a 10 point lead late into the afternoon Saturday until Worth County's Anna Gladstone won the Long Jump to move them into a tie. It was a great weekend for both teams and We'll break them down separately. 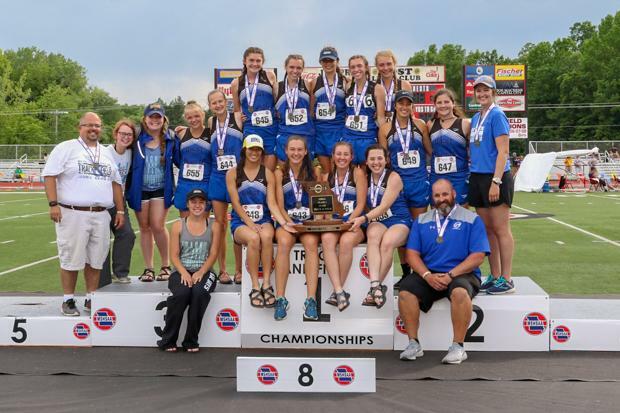 West Platte was lead by Sophia Rush who secured 2nd place finishes in both the 1600 and 3200, and was also a member of their State Champion 4x800 team with Rachel Heili, Lindsay Goodwin, and Sikoya Richard. Mikenna Peters also secured a 3rd place finish in the 300H, while Lexi Elmore took 4th in the in 3200. They also scored in the two sprint relays.. The 4x100 team of Peters, Gracey Raney, Gretchen Raney, and Ciara Davies placed 4th, and the 4x200 team of Faith Stevens, Gretchen Raney, Tori Norman, and Davies placed 2nd. Worth County only brought five girls to State, but boy did they make the most of it. Anna Gladstone lead the way for them winning the 100H and Long Jump, and placing 5th in the 300H and 4th in High Jump. 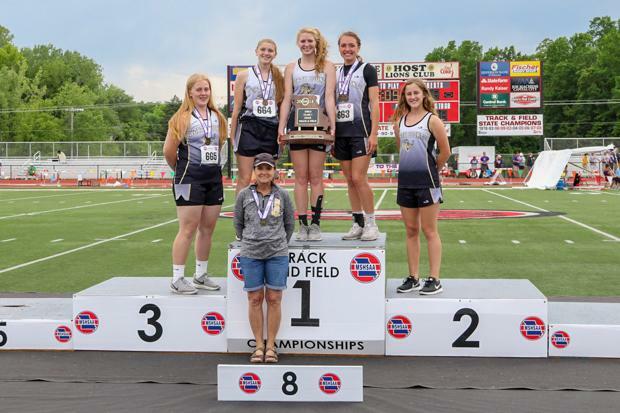 Merrideth Spiers walked away with a State Championship in Discus and was 8th in Shot, while Regan Allee finished 2nd in Pole Vault with Elizabeth Lyle taking 6th in High Jump. Jessica Badell also placed 11th in Pole Vault.